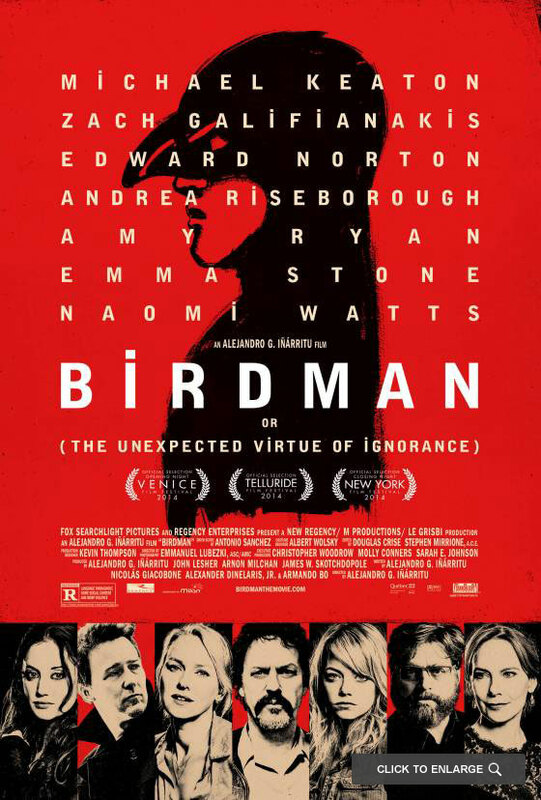 I have always dreamed of flying; unfortunately, there is only one Birdman. It’s a shame he decided to hang up his wings. Riggan Thomson (Michael Keaton from “Need For Speed“) was Birdman, like 20 years ago, in three successful and beloved feature films. As an actor, and as a man, he has struggled to shed the feathers that made him famous. He can’t walk down the street without being recognized – though he knows it’s because he was a guy in a suit and not because of his talent. His latest effort to show the world the real Riggan is a play he writes, directs and stars in that is going to open on Broadway in a few days. His lawyer friend Jake (Zach Galifianakis from “Are You Here“) tries to keep the production and Riggan from falling apart. The day before previews, an actor has to be replaced and they are thrilled to get the amazing Mike Shiner (Edward Norton from “The Grand Budapest Hotel“). Mike is a method actor, and while he brings great talent to the production his method is to piss everyone off and make it all about him, as opposed to the rebirth and revalidation of Riggan Thomson. This play and Riggan’s life are a train wreck that may never leave the station. Riggan is like that guy who played the Lone Ranger, who finds it hard to take off the mask and give up his alter ego. This plays out amongst a gaggle of theater people who struggle with their own facades. Director/writer Alejandro González Iñárritu (“Biutiful”) employs the continuous shot gimmick, though it serves the story well. It draws you in and won’t let you go, much like the Birdman gimmick has a hold of Riggan. You have to go back to “Sunset Blvd.” (Billy Wilder, 1950) to find a better portrayal of how Hollywood discards its icons. Riggan believes he can be the phoenix and rise from the ashes of his career if he can just scrape the stench of Birdman off his shoe. This is not a “feel good” movie where the hero comes through in the end. Nobody feels good in this movie. This is a descent into one man’s darkness as he struggles with the demon he created and the collateral damage of his life. This kind of exploration is not pretty, but like the four-car pile-up on the interstate, we can’t look away, and still, we hope somebody survived. For that I must give this movie 4 ½ stars out of 5. Some dreams are more fragile than others, especially when they are just about to take flight, and you hope they survive. St. Vincent may not be recognized by the Pope, but he should be. I even think he can take St. Jude in two out of three falls. Vincent (Bill Murray from “The Monuments Men”) has had a rough life, and you can see it on his face. He looks like what he is: an angry old man you want to avoid. And that’s the way he likes it. When Maggie (Melissa McCarthy from “Tammy”) and her young son Oliver (Jaeden Lieberher’s feature debut) move in next door, she is forced to hire Vincent to watch Oliver after school. Vincent has to do it because his main job of being a bad example does not pay very well. I must say that Vincent is not a bad person; it’s just everything he does and says is bad, no matter whose bible you go by. He is capable of doing good things, but seldom on purpose. For some reason Oliver likes him, even though Vincent introduces him as “$12 an hour.” Once the cat, who looks just like Vincent, takes a shine to the kid, Vincent opens up his crusty old heart a bit. Maggie figures he may be “too old to be dangerous,” but Vincent is used to being underestimated. 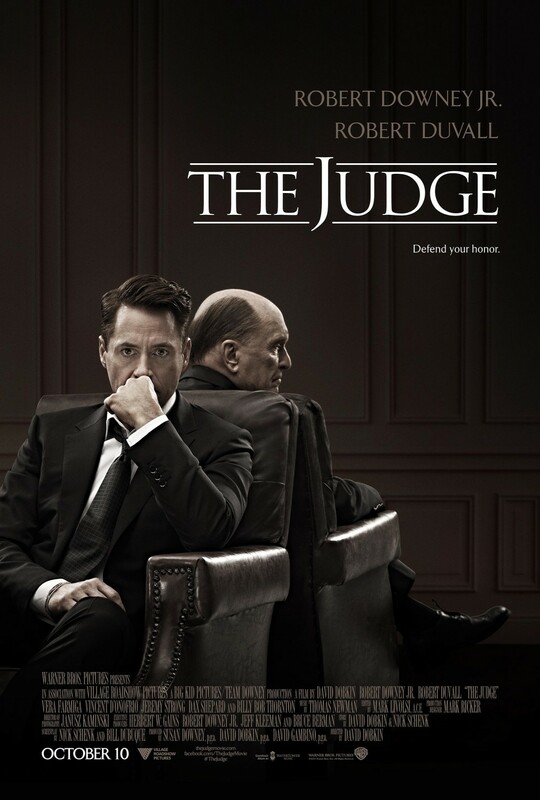 Much like last week’s “The Judge,” this movie starts with some archetypes and a “Karate Kid” kind of setup. The difference here is we do not dive into the deep end of the pool from that familiar jumping off place. Here they pee in the pool and sneak out the back door. 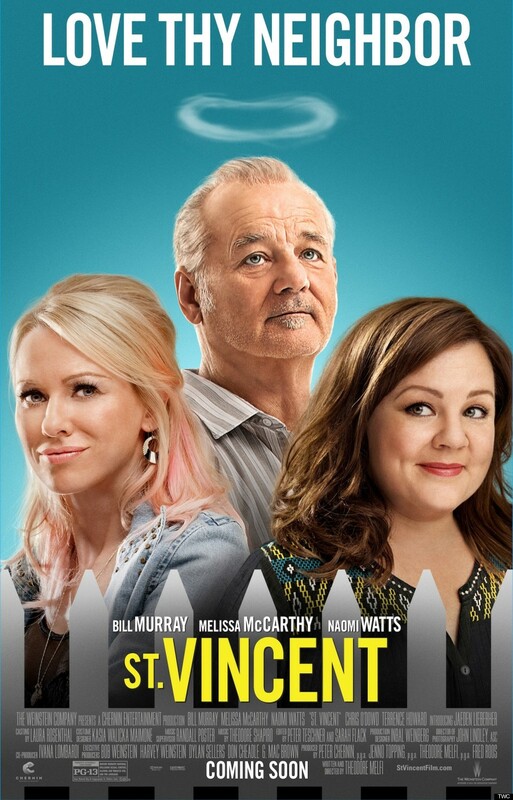 This movie will make you look at Bill Murray differently, and old people in general. He may be a sad clown, but what if somebody could make him laugh? Also, McCarthy sheds her usual shtick and proves to be an excellent foil for the master. I personally feel saved after seeing this movie, as it kept me from a Nicholas Sparks rom-somber-com movie. I believe that saints walk among us, and they are not easy to spot. If you see this movie you may realize one lives next to you. For that I must give this movie 4 ½ stars out of 5. I will now bow my head for “St. Vincent,” the best movie I have seen this year. Going to see “The Judge” never sounds like the right thing to do, but now that I have, I am going to give up my right to be silent. The Judge (Robert Duvall from “Crazy Heart”) has spent 42 years on the bench dispensing justice in his small hometown. When his wife of 50 years dies, his middle son, Hank (Robert Downey, Jr. from “Chef”), finally comes home. The two have not spoken in decades, and the gulf between them is still there. Hank is about to head back to his defense lawyer job in the big city when they find out the Judge may have hit someone with his car. Hank takes on the case since the next best thing in the small town could not get you out of a parking ticket. The contrived bits bothered me as they piled up. The marriage problems, the old girlfriend back home, and the simple son who does nothing but record 8 mm home movies that come in handy just at the right moment. They are all done well, but they have been done so many times before and this kind of window dressing is unnecessary. All this is on top of the son who becomes a great defense attorney only to defend his father and prove himself by saving the Judge and their relationship. You can almost hear the pitch to the studio and the suit that tossed in the bit about having a tornado so everyone could have a physical metaphor for their relationship. What saved this movie from the $3 Walmart discount bin were the moments with Downey and Duvall. The way they played out their father-son story touched me, in a good way. All the old man did was judge – from the bench and while looking down his nose at his son. Most people in the town thought his first name was Judge. There is a great supporting cast here, with some wonderfully nuanced performances that provide some pleasing distractions, as that is all the script seemed to allow. I think the filmmakers were going for “August: Osage County,” but they missed the bus. This movie tried to be too many things in a tried and trite way. However, I find I must rule based upon the evidence presented, and therefore I sentence this movie to 3 ½ stars out of 5. At least Downey got to wear a suit that wouldn’t rust. 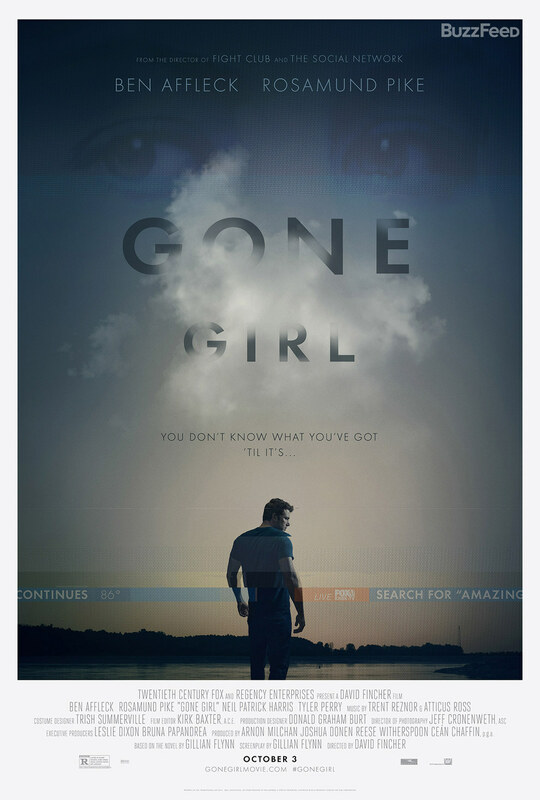 With a nod to Hall & Oates, I saw “Gone Girl” today, and she is gone, but did anybody look at Daryl’s house? Nick (Ben Affleck from “Argo“) and Amy (Rosamund Pike from “The World’s End”) are like most married people: happy on the outside and suffering on the inside. She goes missing on their fifth anniversary. There are signs of a scuffle at the house, and the police wait about 20 minutes before they suspect Nick. He claims he had nothing to do with this and can explain the recent increase in her life insurance, the pre-nup, and everything being in her name. Soon there are things Nick cannot explain. When you are accused of a crime that’s splashed all over TV, you need a lawyer like Tanner Bolt (Tyler Perry from “The Single Mom’s Club”) to help you navigate the spotlights and prepare you for the Court of Cable Opinion. Bolt is so good, with his unique “gummy bear” technique; I would call him if I were ever in trouble. This movie is a great peek inside one of these nightmares from the point of view of the accused. You are with him, and you want to believe. The tension is there in every scene and on every face and you are sure you know where this is going… until it doesn’t go there. I would tell you more, but I still don’t know what I believe. In the hands of David Fincher (“The Girl With the Dragon Tattoo”), this “movie of the week” saga comes pouring out like the top shelf bourbon Nick downs just before his wife goes missing. Fincher plays the perfect tempo as he unravels the plot with a steady beat of backstory. The movie is a little long at two hours and 29 minutes, but just use the “Run Pee” app like I do and you will get through it. I have read people think Affleck will get an Oscar for this movie, and he was good, but he just played Ben Affleck. He played himself so well I’ll bet you Jennifer Garner sleeps with a gun under her pillow.